Adobe EchoSign is a fully automated, cloud-based electronic signature solution which speeds up the document signing process with e-signatures, tracks contract status in real time, stores all signed agreements in secure online repository and delivers an exceptional user experience. It provides a powerful platform to eliminate tedious paperwork, close business deals faster, and streamline business processes. Along with the most up-to-date technologies, Adobe EchoSign adheres to the latest best-practice policies for online security. Organizations of all sizes rely on it to accelerate critical business processes in Sales, HR, Legal, and Operations. Adobe EchoSign is the easiest e-signature solution . Sending and getting documents signed online is as easy as sending an email – no special software to download or install. It’s simple to send digital documents out for signature with a single click, and recipients can e-sign agreements on any smartphone, tablet, or browser. Adobe EchoSign is fully compliant with the ESIGN Act of 2000 and the Uniform Electronic Transaction Act (UETA) with EchoSign. With Adobe EchoSign you can conduct business-critical transactions with confidence. Documents are stored in an online repository, that’s more secure and simple to search, and uses passwords and permissions to control document access. All communications, passwords, and documents in EchoSign system are encrypted. Documents processed through Adobe EchoSign can be signed anywhere. 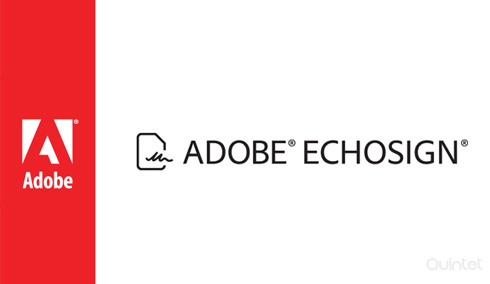 Adobe EchoSign is accessible from any computer, smartphone, or tablet. Quintet has expert developers who are able to work with Adobe EchoSign as a provider of electronic signature solutions. Quintet make the processes of sending, signing, tracking, and storing business documents faster than you ever thought possible. Adobe’s solutions will help provide a platform to send and legally e-sign quickly prepared estimates, contracts, agreements, and other documents on your smart phone, tablet, or any web browser. Sending a document to be e-signed is as easy as sending an email. With EchoSign, we help you to go from send to signed in a matter of minutes. With the help of EchoSign, our developers ensure that your documents are stored in secure Adobe cloud platform and you can conduct business-critical transactions with confidence. It also provides control access using passwords and permissions. A certified PDF of the executed contract can be send as required. Adobe EchoSign Digital Certificates assure recipients that a document has been issued by EchoSign and has not been altered. Quintet provides you real-time visibility into the status of your document with EchoSign, you can precisely know when it’s opened, signed, and returned. EchoSign automatically records and stores the details of each document’s history, so you can view and record every step. We help you to cross borders. Electronic signatures collected with EchoSign are legally valid and enforceable in countries around the world and it’s simple to specify the order of multiple people to e-sign a single document. Quintet has years of experience in creating and implementing APIs for multiple platforms. Our services include API Interface design, development and integration.We are proficient in API Integration of Yahoo, Google, Facebook, Twitter, Pinterest, Paypal, Amazon and much more for your web applications, iOS and Android devices. Yahoo Local provides us with features such as Local Listings, Local Review, Local News/Regional News, etc. Yahoo Local makes a great addition bringing in location-based relevancy and people's experience about a place. At Quintet we are professionals when it comes to integrating Yahoo Local API's . Quintet offers offshore professionals who are experienced in LinkedIn API integration . We help you to integrate Linkedin's API Services and Linkedin's Plugins. Linkedin's social platform provides valuable information about businesses, employees, jobs and future prospects. Android Lollipop which is Android 5.0 has come into the market with amazing new features. Our team here at Quintet can help you develop apps on this new OS platform version by Android. We can also make your already existing Android app, version 5.0 compatible. Quintet is a Web Design company which is dedicated to providing customers all around the world with the latest best-of-class feature rich web sites for presenting your products and services. Creating the best web applications with uncompromising usability, security, scalability and reliability using the latest technologies is our speciality. Quintet helps you to tap the full potential of your business and makes you a leader in the apps market. We develop Stable and secure mobile apps for all types of mobile platforms iOS, Android, Blackberry . Come to us and let us build your high quality, smart and feature rich mobile applications. Copyright © Quintet Solutions Pvt. Ltd. 2019 | All Rights Reserved.